When it comes to choosing career options then today you may find myriads of options, The good thing about the present time is that we have many professional courses surging in the market thus leading to a plethora of job opportunities. One such field which seems to be rising high is animation & Graphic Designing. It is one of the fastest growing industries in India. With more than 300 animation studios in India, it is estimated to employ more than 15,000 animations professionals in the times to come. As per the reports of FICCI KPMG 2015 report, 2014 saw the highest growth in the VFX, i.e., 22%. This growing number indicates that the field of animation is growing and thus we have seen an increasing number of animation training institutes. 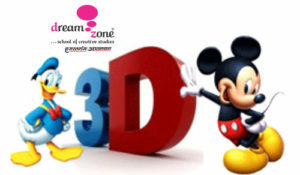 Dream Zone Hazratganj is one of the renowned institutes providing myriads of professional courses including certification and diploma courses in animation & Graphic Designing. We have seen a growing number of institutes around, but only a handful of them offer theoretical and practical knowledge and that’s what makes Dream Zone Alambagh & Hazratganj different from the others. In this blog, we will be explaining in-depth about animation course, its job prospects, and remuneration that you get after completing this course. Before going ahead, we would like to tell that for growth in any business, it is important that you must have the passion for pursuing the course and the same is applicable in animation. It is one field where you can enjoy while you work. The good part about animation & graphics designing is that you can join this course after completing your 12th. The eligibility criteria may vary from one institute to another. So you must cross-check with the desired institute before planning to enroll in this course. Now comes the most important part and that is remuneration. Before pursuing any field, our first area of concern is how much salary are we going to learn from this profile? Well, as an animator your starting salary could range somewhere between Rs.12000 to Rs.18000. However, with the increasing experience, you can expect the salary to grow as well. Another great news for the pursues of animation course is that many foreign companies from Europe are outsourcing the work in India which again paves the way for new job opportunities. You can also start offering freelance services to companies. The best part about any professional course is that you can begin to learning these courses at the point of time, whether you are a beginner or a professional, working or a homemaker, the professional courses have become the new avenue of job opportunities for all. Our Role: As a key driver of growth in the field of learning, Dream Zone Hazratganj & Alambagh believes that it’s never too late to start learning. So, we have a number of professional courses enlisted with us which you can join. We provide state of the art learning atmosphere which will help you grow professionally and personally.